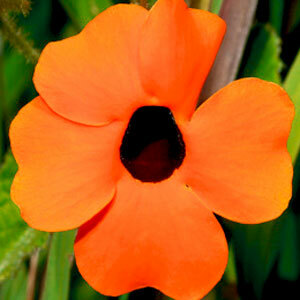 Thunbergia (more commonly known as Black-eyed Susan Vine) is a native of Tropical Africa. It is a vining seasonal bloomer that can reach a spread of 8 feet wide. With evergreen leaves and orange or yellow blooms, this perennial is the right choice for hanging baskets, cascading color for combination planters, and trellises. Thunbergia bloom in the late summer and early fall as the days shorten. Adding these to your summer program can produce early fall sales. For best results with Thunbergia, we recommend using a constant feed program of 150-200 ppm N. Maintain a pH between 5.8 - 6.2. Whiteflies, spider mites, and thrips are the biggest pest problems with Thunbergia. Orange Black Eye Susan are not prone to many diseases, but watch for botrytis while the days are short. This grey rot is usually associated with wet or humid conditions. You can prevent botrytis by allowing the plant to dry out between waterings, allowing for good airflow in your greenhouse, and spacing to allow the sun to penetrate to the soil level. The most common chemicals used to treat botrytis are Medallion and Banrot. Use them as a drench according to each label’s instructions.